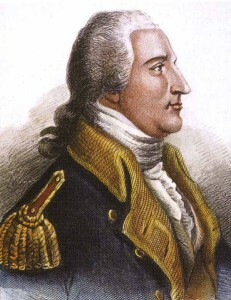 Benedict Arnold was born in Norwich on January 14, 1741. Benedict Arnold was fifth to claim the name; an elder brother bearingthe same name died in infancy in 1739. Benedict Arnold’s father, Captain Benedict Arnold, moved from Rhode Island to Norwich with his brother Oliver to seek their fortunes. The Arnolds hail from a long Rhode Island lineage –Captain Arnold’s grandfather was governor of Rhode Island. Captain Arnold courted Hannah Waterman King, who was descended from the prominent Lathrop and Waterman families, and recently widowed when her husband Captain Absalom King tragically died at sea. In 1733, Benedict and Hannah Waterman King Arnold married and provided a loving home for their children Benedict, Hannah, Mary, Absalom and Elizabeth. Captain Arnold prospered as a respectable merchant and held various town office positions. Benedict enjoyed exploring the warehouses and his father’s trading vessels moored at Chelsea Landing. Benedict’s early years were consumed with conflicts within his community and country. In 1745, differing religious beliefs caused a Separatist Revolt dividing Norwich, including Benedict’s extended family. Britain and France were constantly at war; King George’s War (1744-1748) was about to conclude, but the French and Indian War (1754-1763) was soon to follow. Captain Arnold overextended his business during the King George’s War, which had dire consequences for the family in later years. Benedict Arnold was a mischievous ringleader; Arnold and his friends stole tar barrels from the landing to add to the traditional Thanksgiving Bonfire on Bean Hill, but when confronted by the constable, Arnold threw off his coat and dared the constable to fight. When Norwich celebrated the colony’s victory over the French, Arnold haphazardly lit a cannon and jumped out of the line of fire moments before the canon ignited. Arnold and his friends climbed Meeting House Rocks and played a game similar to an Indian raid. Arnold was “ bold, ambitious, active as lighting,” and a ready wit at command.” Noted for his athletic prowess, Arnold impressed his friends with reckless antics such as riding the waterwheel on a gristmill as it rotated. Arnold swam in the pools beneath Uncas Leap was a bit of a show off as he ice-skated on the frozen ponds during the winter. Some records indicate he participated in the French and Indian War and deserted the army, but these claims are disputed. Revolutionary War veterans told stories of Arnold torturing small animals to prove he was evil since childhood and discredit his military accomplishments. Please view Benedict Arnold’s homestead plaque either first or last because it is not near the other sites. 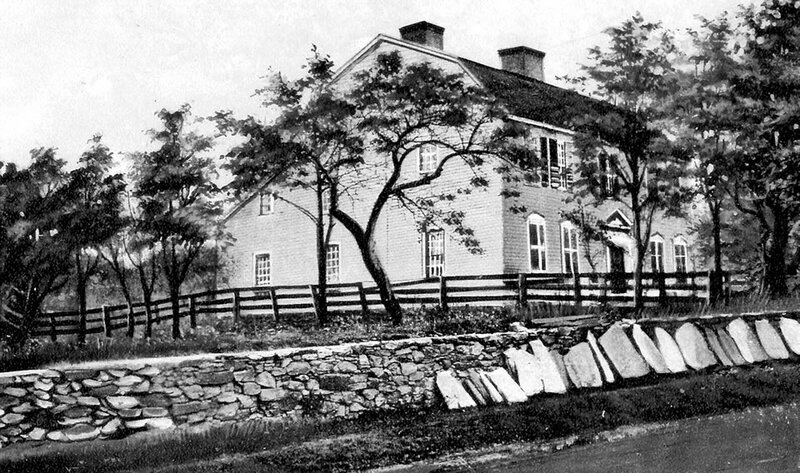 The Nineteenth century image of Arnold’s homestead is representative of a center hall twin chimney, gambrel roofed plan very similar to the circa 1765 Jedediah Huntington House. It is probable if this structure was Arnold’s birthplace that this house started as a smaller structure and was added onto (a very typical practice of the period).